Evening Primrose Oil, Super - 1300 mg, 60 softgels each (Nature's Wonderland) - Penn Herb Co. Ltd. The Precious Oil For Beautiful Skin & Female Vitality! Evening Primrose Oil is a favorite women's remedy because it eases PMS discomforts, maintains beautiful skin, and promotes menopausal health. 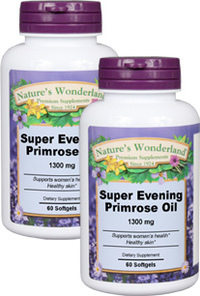 Nature's Wonderland Super Evening Primrose Oil Keeps You Looking & Feeling Your Best! Evening Primrose Oil provides the naturally occurring Omega-6 fatty acid, Gamma Linoleic Acid (GLA). This fatty acid supports healthy prostaglandin levels (PGE1). In the body, this group of hormone-like substances promotes circulation and is important for a healthy inflammatory response. Vegetarian source of GLA; nutritional support for mild discomfort associated with PMS; supports healthy prostaglandin levels; supports healthy immune response; helps maintain health circulatory function; supports breast health. As a dietary supplement take 1 softgel 1 to 2 times daily, preferably with meals.